A European species collected as a weed near an old house site on South Manitou Island, Leelanau Co. in 1984 by B. T. Hazlett. Seen occupying large areas near the base of the shoreline bluffs on the south side of South Manitou Island in 2016. This is a very large, fiercely prickly, and aggressive plant that is a serious pest in some parts of North America. 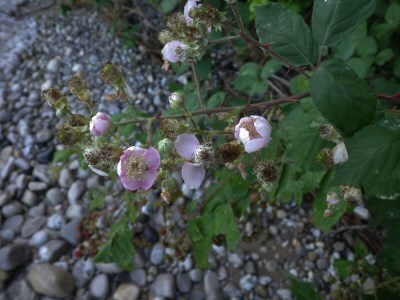 The plant resembles a large version of our native blackberries, but differs in the pinkish flowers, dense whitish pubescence on the undersides of the leaves, and more paniculate inflorescence. The collection mapped from Mecosta Co. (S. Ross 636, MICH) is fragmentary and consists of only the much-branched inflorescence, which has pale pink flowers but lacks prickles. It may be a depauperate or shaded plant of this species or possibly a hybrid. We include in this plants called R. armeniacus Focke. MICHIGAN FLORA ONLINE. A. A. Reznicek, E. G. Voss, & B. S. Walters. February 2011. University of Michigan. Web. 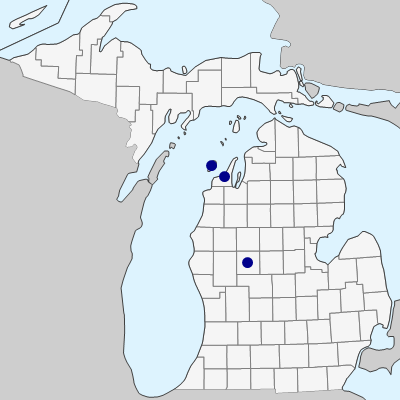 April 24, 2019. https://michiganflora.net/species.aspx?id=2553.